Nirvāṇa (Pali: Nibbāna, meaning "extinction" or "blowing out" of the triple fires of greed, anger, and delusion), is the highest goal of Theravada Buddhism, understood to be the end of suffering (dukkha). The Buddha described nirvana as the unconditioned mode of being that is free from mind-contaminants (kilesa) such as lust, anger, or craving. It is the highest spiritual attainment, which dissolves the causes for future becoming (Karma) that keep beings forever wandering through realms of desire and form (samsara). The concept of nirvana remains an important ideal and aspiration for millions of Buddhists around the world. Traditionally, definitions of nirvana have been provided by saying what it is not, thus pointing to nirvana's ineffable nature. The Buddha discouraged certain lines of speculation, including speculation into the state of an enlightened being after death, on the grounds that such questions were not useful for pursuing enlightenment; thus definitions of nirvana might be said to be doctrinally unimportant in Buddhism. Approaching nirvana from the angle of the via negativa, the Buddha calls nirvāna "the unconditioned element" (i.e., not subject to causation). It is also the "cessation of becoming" (bhavanirodha nibbānam) (SN-Att. 2.123). Nirvana is also never conceived of as a place, but the antinomy of samsāra, which itself is synonymous with ignorance (avidyā; Pāli: avijjā). Additionally, nirvana is not the clinging existence with which humanity is said to be afflicted. It has no origin or end. It is not made or fabricated. It has no dualities, so that it cannot be described in words. It has no parts that may be distinguished one from another. It is not a subjective state of consciousness. It is not conditioned on or by anything else. Doctrinally, "'the liberated mind (citta) that no longer clings’ means Nibbāna [Nirvana]” (Majjhima Nikaya 2-Att. 4.68). Positively speaking, nirvana carries connotations of stilling, cooling, and peace. The realizing of nirvana is compared to the ending of avidyā (ignorance) which perpetuates the will into effecting the incarnation of mind into biological or other form, passing on forever through life after life (samsara). Samsara is caused principally by craving and ignorance (see dependent origination). Nirvana, then, is not a place nor a state; it is an absolute truth to be realized. 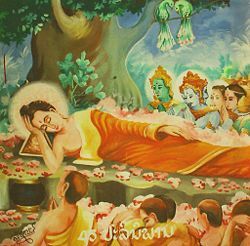 In Buddhism, parinirvana (meaning "complete extinction") is the final nirvana, usually understood to be within reach only upon the death of the body of someone who has attained complete awakening (bodhi). It is the ultimate goal of Buddhist practice and implies a release from the cycle of deaths and rebirths as well as the dissolution of all worldly physical and mental aggregates known as skandhas (form, feeling, perception, mental fabrications, and consciousness). When a person who has realized nirvana dies, his or her death is referred as parinirvana (fully passing away) and it is said that the person will not be reborn again. Buddhism holds that the ultimate goal and end of samsaric existence (of ever "becoming" and "dying" and never truly being) is realization of nirvana; what happens to a person after his parinirvana cannot be explained, as it is outside of all conceivable experience. The Buddhist term Mahaparinirvana, meaning "great, complete Nirvana," refers to the ultimate state of nirvana (everlasting, highest peace and happiness) entered by an Awakened Being (Buddha) or "arhat" (Pali: arahant) at the moment of physical death, when the mundane skandhas (constituent elements of the ordinary body and mind) are shed and only the Buddhic skandhas remain. However, it can also refer (in the Mahayana) to the same inner spiritual state reached during a Buddha's physical lifetime. In the Mahayana Buddhist scripture entitled the "Mahayana Mahaparinirvana Sutra," the Buddha teaches that unlike "ordinary" nirvana, "Mahaparinirvana" is the highest state or realm realized by a perfect Buddha, a state in which that Buddhic being awakens to "the Eternal, Bliss, the Self, and the Pure." Only in Mahaparinirvana is this True Self of the Buddha said to be fully discernible. One can understand the relationship between nirvana and samsara in terms of the Buddha while on earth. Buddha was both in samsara while having attained to nirvana so that he was seen by all, and simultaneously free from samsara. Vàna, implying the path of rebirth, + nir, meaning "leaving off" or "being away from the path of rebirth." Vàna, meaning "stench," + nir, meaning "freedom": "Freedom from the stench of distressing kamma." Vàna, meaning "dense forests," + nir, meaning "to get rid of" = "to be permanently rid of the dense forest of the five aggregates (panca skandha)," or the "three roots of greed, hate, and delusion (lobha, dosa, moha)" or the "three characteristics of existence" (impermanence, anitya; unsatisfactoriness, dukkha; soullessness, anàtma). Vàna, meaning "weaving," + nir, meaning "knot" = "freedom from the knot of the distressful thread of kamma." In Mahāyāna Buddhism, calling nirvana the "opposite" of samsāra or implying that it is separate from samsāra is doctrinally problematic. According to early Mahāyāna Buddhism, nirvana and samsara can be considered to be two aspects of the same perceived reality. By the time of Nāgārjuna (second century C.E. ), the identity of nirvana and samsāra are alleged. The Theravāda school makes the dichotomy of samsāra and Nibbāna the starting point of the entire quest for deliverance. Even more, it treats this antithesis as determinative of the final goal, which is precisely the transcendence of samsara and the attainment of liberation in Nibbāna. Where Theravada differs significantly from the Mahāyāna schools, which also start with the duality of samsāra and nirvana, is in not regarding this polarity as a mere preparatory lesson tailored for those with blunt faculties, to be eventually superseded by some higher realization of non-duality. From the standpoint of the Pāli Suttas, even for the Buddha and the Arahants, suffering and its cessation, samsāra and Nibbāna, remain distinct. The nature of nirvana is discussed in what alleges to be the final of all Mahayana sutras, allegedly delivered by the Buddha on his last day of life on earth—the Mahaparinirvana Sutra or Nirvana Sutra. Here, as well as in a number of linked Tathagatagarbha sutras, in which the Tathagatagarbha is equated with the Buddha's eternal Self or eternal nature, nirvana is spoken of by the Mahayana Buddha in very "cataphatic," positive terms. Nirvana, or "Great Nirvāna," is indicated to be the sphere or domain (vishaya) of the True Self. It is seen as the state that constitutes the attainment of what is "Eternal, the Self, Bliss, and the Pure." Mahā-nirvāna ("Great Nirvana") thus becomes equivalent to the ineffable, unshakeable, blissful, all-pervading, and deathless Selfhood of the Buddha himself—a mystery which no words can adequately reach and which, according to the Nirvana Sutra, can only be fully known by an Awakened Being—a perfect Buddha—directly. The attributes of Nirvana are eightfold. What are these eight? Cessation [nirodha], loveliness/ wholesomeness [subha], Truth [satya], Reality [tattva], eternity [nitya], bliss [sukha], the Self [atman], and complete purity [parisuddhi]: that is Nirvana. He further states: "Non-Self is Samsara [the cycle of rebirth]; the Self (atman) is Great Nirvana." It is not the case that the inherent nature of Nirvāna did not primordially exist but now exists. If the inherent nature of Nirvāna did not primordially exist but does now exist, then it would not be free from taints (āsravas) nor would it be eternally (nitya) present in nature. Regardless of whether there are Buddhas or not, its intrinsic nature and attributes are eternally present… Because of the obscuring darkness of the mental afflictions (kleśas), beings do not see it. The Tathāgata, endowed with omniscient awareness (sarvajñā-jñāna), lights the lamp of insight with his skill-in-means (upāya-kauśalya) and causes Bodhisattvas to perceive the Eternal, Bliss, the Self, and the Pure of Nirvāna. According to these Mahāyāna teachings, any being who has reached nirvana is not blotted out or extinguished: There is the extinction of the impermanent and suffering-prone "worldly self" or ego (comprised of the five changeful skandhas), but not of the immortal "supramundane" Self of the indwelling Buddha Principle (Buddha-dhatu). Spiritual death for such a being becomes an utter impossibility. The Buddha states in the Mahāyāna Mahāparinirvāna Sutra (Tibetan version): "Nirvāna is deathless… Those who have passed into Nirvāna are deathless. I say that anybody who is endowed with careful assiduity is not compounded and, even though they involve themselves in compounded things, they do not age, they do not die, they do not perish." There are many misconceptions surrounding the Buddhist concept of nirvana, which derive from Buddhism's connection to Hinduism. Metaphysically, it should be noted that nirvana is not considered to be the same as the Hindu concept of moksha. Though the two concepts may appear to be similar because each refers to an escape from samsaric suffering, they, nevertheless, are still based on different metaphysical presuppositions and are incomensurate. In the Saamannaphala Sutta of the Digha Nikaya, the Buddha clearly outlines the differences between his teaching of nirvana and the Hindu schools' teaching, which are considered to be wrong views. The Buddha emphasized that the Hindu belief in a permanent self (atman) not only negates the activities of moral life but also falls in a form of grasping, a hindrance to spiritual liberation. …which identifies the psycho-physical person (naama-ruupa) with the body (ruupa), rejecting human effort and the world hereafter (para loka). When the body is dead, it entails the total annihilation of the psycho-physical person, without the continuity of the consciousness for bearing moral retribution of his deeds done. Therefore, the early Buddhist concept of nirvana differs both from the Vedic concept of nirvana as described in several Upanishads, especially the Nirvana Upanishad, as well as the Vedic concept of moksha, the union of the atman (soul) with Brahman, nor is it the same as Heaven in many other religions. ↑  Bhikkhu Thich Nhat-Tu, Distinction of the Buddha's Teachings from Brahmanism and Sramanism. Yamamoto, Kosho. 2000. Mahayanism: A Critical Exposition of the Mahayana Mahaparinirvana Sutra. London: Nirvana Publications. Buddha - A Hero's Journey to Nirvana. Salvation Versus Liberation, A Buddhist View of Paradise Worlds. Mind Like Fire Unbound – a discussion of fire imagery as used in the Buddha's time. A Buddhist practice based on the four stages of the Buddha's enlightenment that lead him to Nirvana. Nirvana – a modern scientific view. The Life of Buddha in Legend and Art. This page was last modified on 5 December 2018, at 15:36.